While thinking about how to boil down my over a dozen years in working with analysts, journalists and other influencers, I came across this this very interesting, very useful chart from a firm called Influencer50, which classifies influencer types along the timeline of when a decision maker is deciding to buy. Interestingly there are basically two decisions in the process: the decision to do something (i.e. the recognition of some kind of pain) and the decision of what to do about that pain. 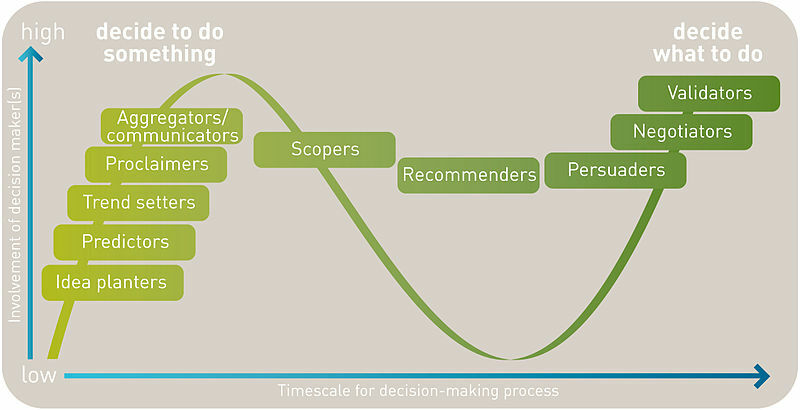 Some influencers will have more impact early on in the cycle, for example a journalist or peer may be instrumental in bringing to awareness the problem that needs to be solved, so these could be considered “idea planters.” And certain industry analysts could be considered “recommenders,” for when the purchaser is looking for help in narrowing down a shortlist slightly later in the purchasing cycle. We’ll be taking a look at this model, and taking it to the next step of how to identify your buyers’ key influencers (hint: it always helps to ask your customers), and then how to keep your company on the influencers’ radar and maintain a productive and meaningful relationship. I hope to see you at the conference, and please come up and say hello during one of the breaks.